This article is a little bit of a departure for me. Typically I write about VHF/UHF communications, but I’m dipping my feet into the microwaves and have thrust headfirst into the world of Broadband-Hamnet. Broadband-Hamnet, formally known at HSMM ham radio, is a high speed mesh data network running on off the shelf 802.11b/g routers with a custom firmware. The mesh is a self discovering, self healing, redundant communications system that offers internet protocol (IP) services over the air. What makes the mesh attractive to ham radio operators and emergency communicators is that the first six channels of the 802.11b/g protocol fall within the 2.4 GHz amateur radio band. That means amateur radio operators may modify the routers with custom firmware, add high gain antennas, and otherwise experiment to squeeze more range and capabilities out of off the shelf wireless networking equipment. So what got my attention of broadband-hamnet was a video produced by the ARRL called the DIY of Ham Radio. One segment showed hams deploying a mesh network at the Dayton Hamvention. I thought to myself: this could be the answer to networking our Field Day site. I proceeded to get a few more hams interested in the concept, one thing led to another, and this spring we have our first node on the air with the goal of a citywide ham radio mesh network. I like being on the bleeding edge of technology, back in 2000 mine was the second APRS station to go on the air in our community. 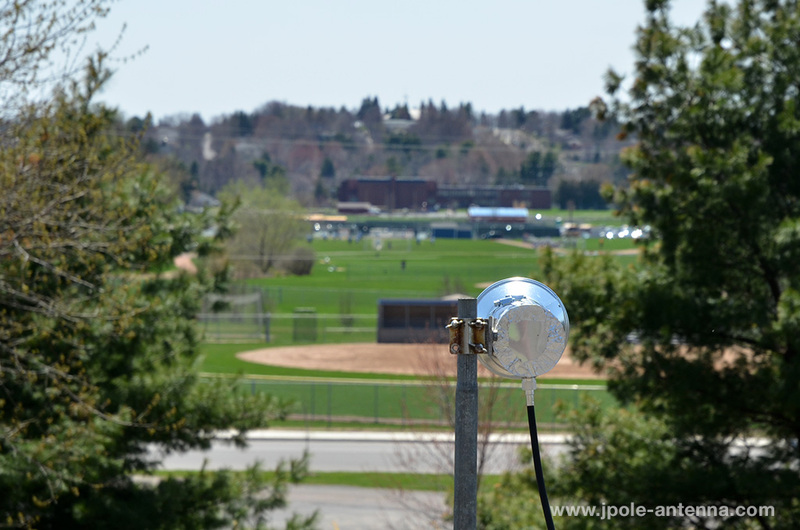 Like APRS I see the potential for emergency communications that broad-band hamnet provides and know it takes one or two stations to get on the air to create the excitement necessary to build out our network. With that, I’ve been researching antenna designs looking for something inexpensive and easy to build, so that mesh stations can get on the air with a minimum investment. My Waveguide Cantenna antenna is the answer. You may remember the Pringles 802.11b Cantenna from years back. 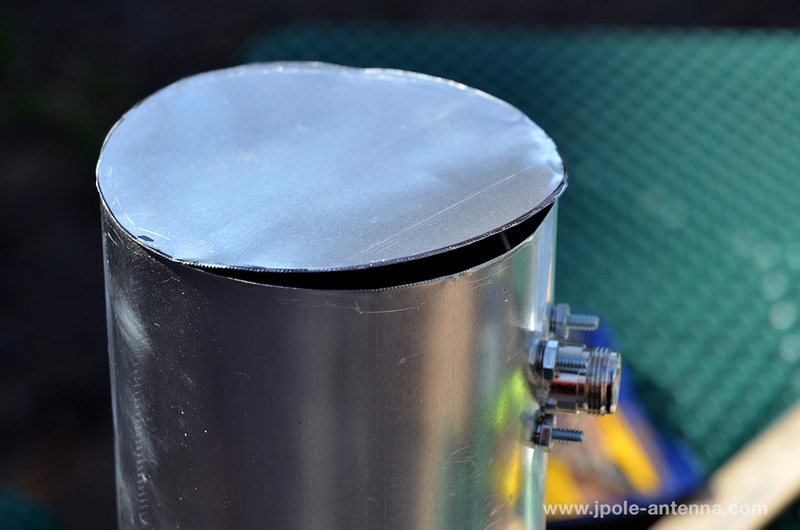 Well, those antennas really didn’t work, the diameter of the tube was too small for 2.4 Ghz and the foil lining didn’t make the best reflector. 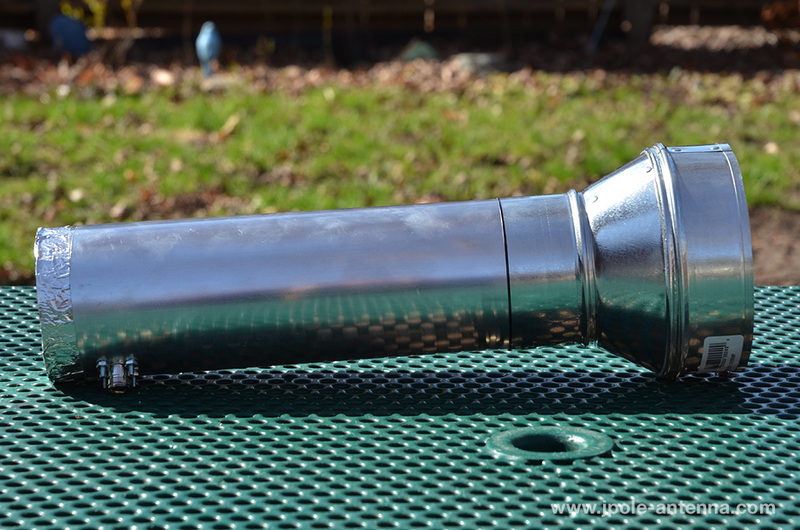 I’ve seen other cantennas made out soup cans, coffee cans, and other types of recycled materials; but things didn’t come together until I found a blog post by Mike of Mike’s Tech Blog on building a cantenna out of 4 inch diameter aluminum dryer vent pipe. 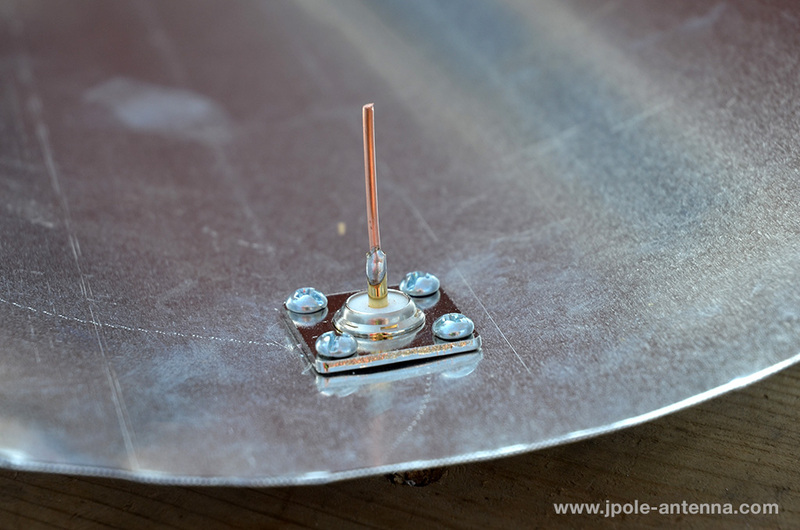 I liked the design and decided to try my hand a building a 2.4 GHz Waveguide Cantenna Antenna. So how does the Cantenna work? The Waveguide antenna is a relatively simple principle. 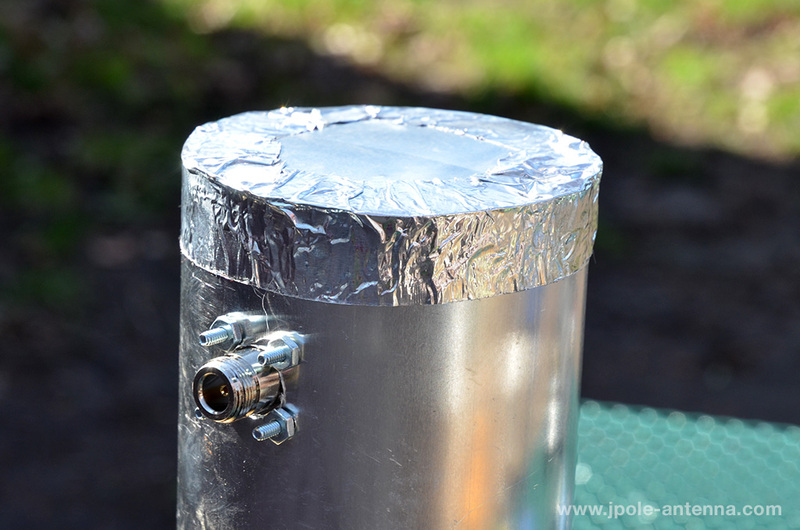 Inside the tube is a 1/4 wave radiator positioned 1/4 wave away from the rear of the antenna. In front of the radiator, the tube is approximately 3/4 wave long. The signal emits from the radiator, is reflected off the back of the antenna and guided or directed by the length of the tube. The result is a highly directional, high gain signal. You can even lengthen the tube to increase the gain and directivity or add a funnel on the end to increase the antenna’s sensitivity. Ready to build one? You’ll need to gather a few tools and take a trip to the home improvement store, but you can put one of these together for less than $15. 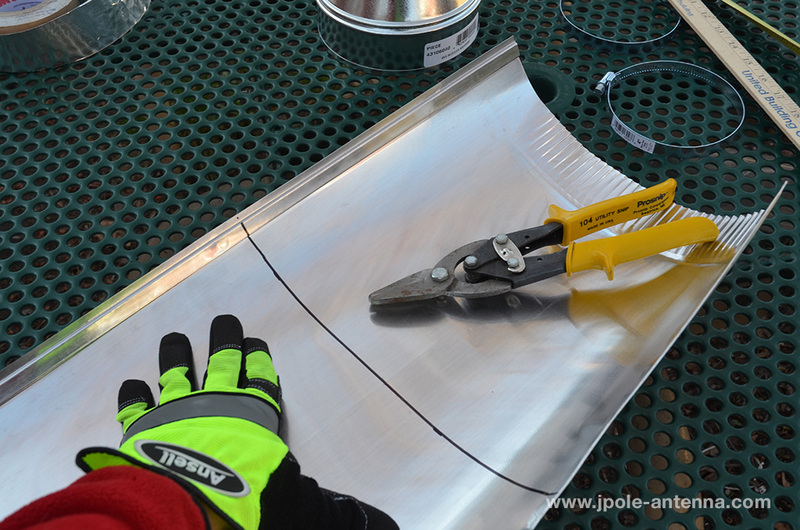 The aluminum sheeting has sharp edges, so wear gloves when working with it. Trust me, you don’t want to slice your hand on this stuff. 2. Mark a spot 1.75 inches from the edge of the vent tube. Place your N connector on that centerpoint and trace around it. Use your drill to make a hole at the center point and use the Dremel to cut out a circle for the plug end of the N connector to fit through. 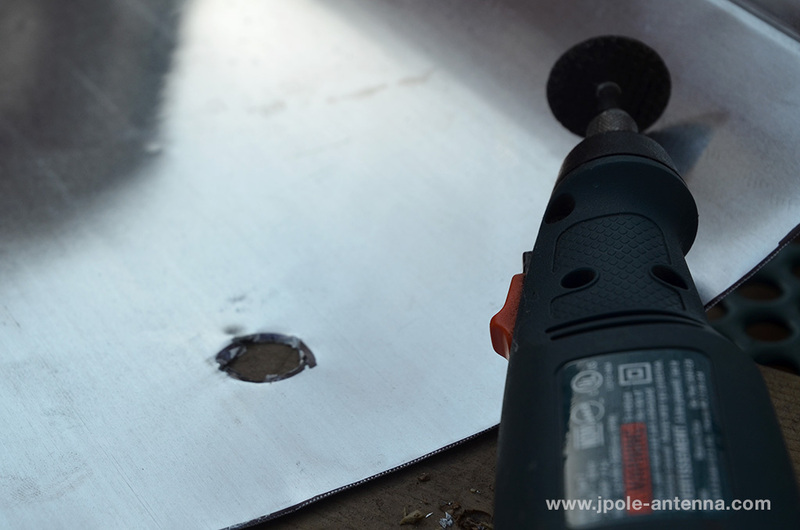 Once the hole is cut, stick the connector into the hole, measure again to verify the radiator will be 1.75 inches from the end and mark the location of the bolt holes of the connector on the aluminum. Drill the holes with a 9/64 inch bit. The radiator will be 1.25 inches long. I like to use a little bit longer piece of wire and trim it to length after its soldered to the connector. Measure from the dielectric base of the connector when you mark and trim the radiator. 4. Bolt the connector to the aluminum sheet. #6 bolts are a little too big to easily fit through the holes in the chassis connector. I used a 9/64 inch drill bit to carefully drill out the holes a bit. I also didn’t have 1/4 inch bolts, so after mounting the connector I cut the excess length of the bolts with the Dremel tool. At this point you can assemble the tube. Carefully roll the aluminum sheet and lock the two ends together. 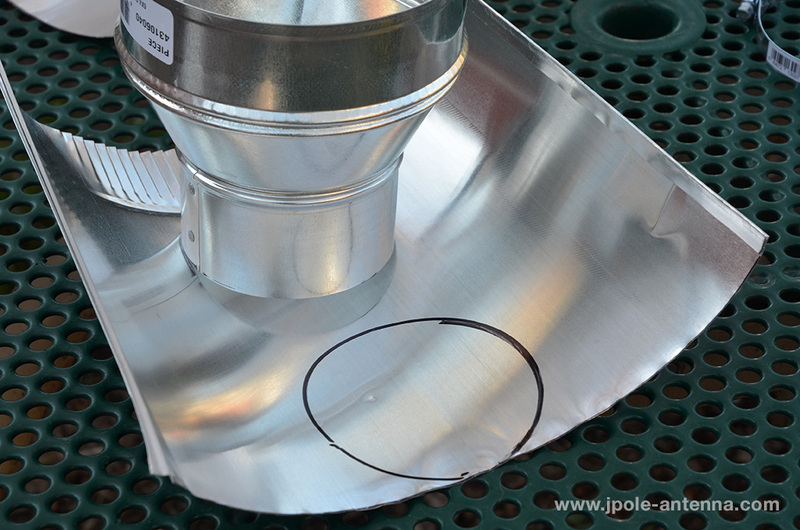 Set the tube on the extra portion of the aluminum and trace out a circle. Or use the 4×6 inch reducer to trace a 4 inch disc. Carefully the disc out with the tin snips. 6. Tape the disc to the end of the tube with aluminum foil tape or standard duct tape. Your antenna is now done. You can add the 4 to 6 inch reducer to the front of the antenna to increase it’s sensitivity. The reducer acts like a funnel to draw in the signals. 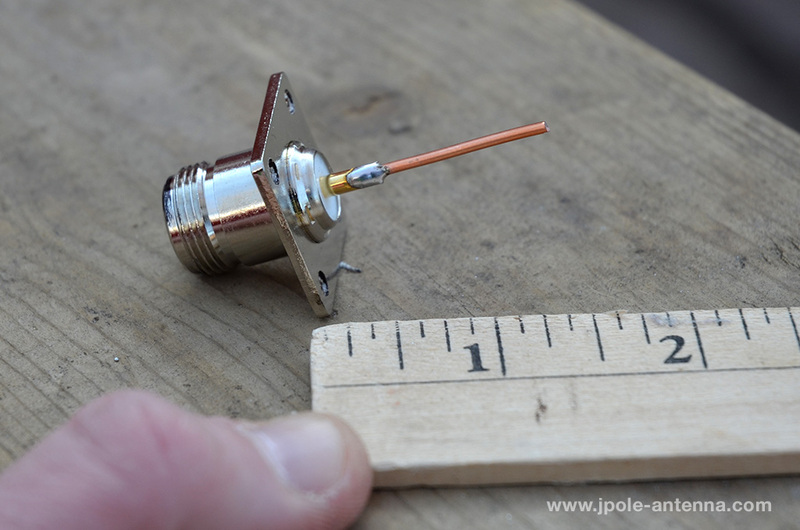 It won’t increase your gain, but will help the antenna hear better. Use the 4 inch hose clamps to attach a mounting bracket to the antenna. For testing I used a bracket from another antenna, but I’ll eventually fabricate something out of 1/8 inch aluminum and a couple of U-bolts. Unfortunately I don’t have any test equipment that works in the 2.4 GHz range. 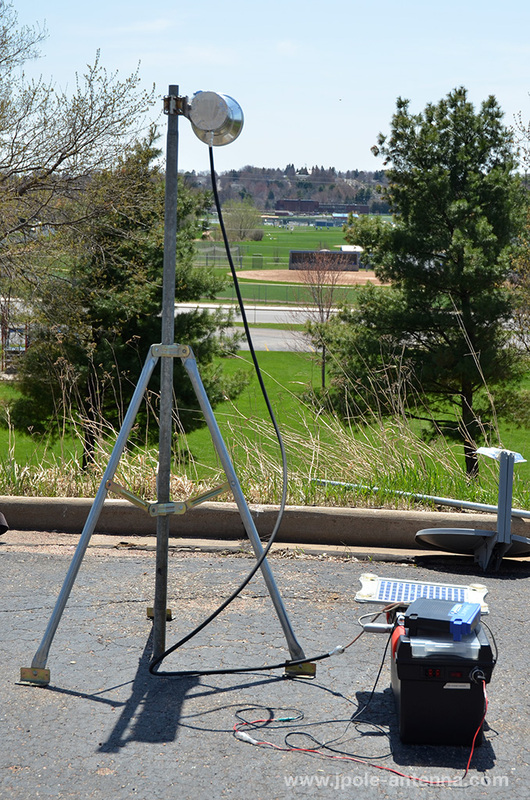 But we did do some range testing and comparisons between this antenna and a parabolic reflector antenna. The good news is that the Waveguide Cantenna Antenna held it’s own against the parabolic reflector. We estimated that the parabolic antenna has about 20 dbm of gain and the cantenna was showing close to 16 dbm in our tests. Not too bad for a thirty minute project and $15 in parts. In one test we established a .78 mile link with the Cantenna on one end and a parabolic on the other. Signal was 70 on the Cantenna and 63 on the Parabolic. Noise was a bit higher on the Cantenna, but that may be due to environmental factors. Needless to say it was a solid connection and holds promise of using these inexpensive antennas to help build out our network. 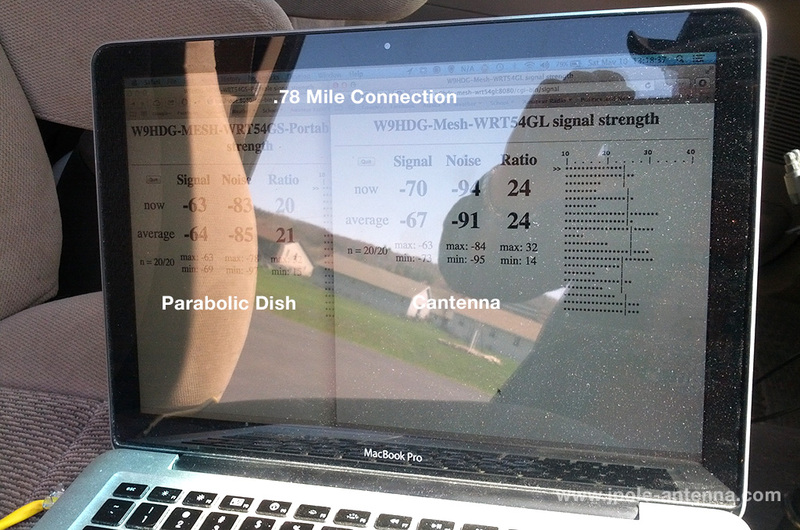 As soon as I get access to some test equipment, I’d like to actually see what the performance of this antenna looks like on the monitor. Until then, we’ll keep testing and tuning. 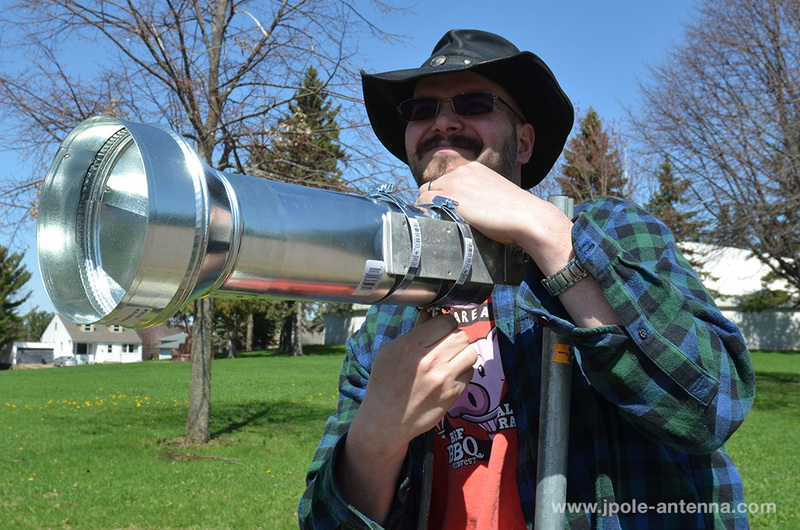 Also, a 4 inch diameter tube is a little bit big for the 2.4 Ghz band and will drop the frequency to a spot just below the 2.4 Ghz band. Optimally, you’ll want a tube that’s about 3.5 inches in diameter. But the bigger tube does work, it’s just not the most efficient. If you want to experiment with different tube diameters and lengths, this Waveguide Antenna calculator is a good starting point in designing an antenna. As I mentioned earlier in my article, our goal last year was to get a mesh network up and running for Field Day. Initially we were going to use routers flashed with the DD-WRT firmware, but ran into problems setting up the multiple wireless repeaters. I’m glad to say that after a year of studying and playing around with Broadband-Hamnet, we now have a firm game-plan and a better knowledge to what needs to be done to get our ad-hoc mesh network on the air. 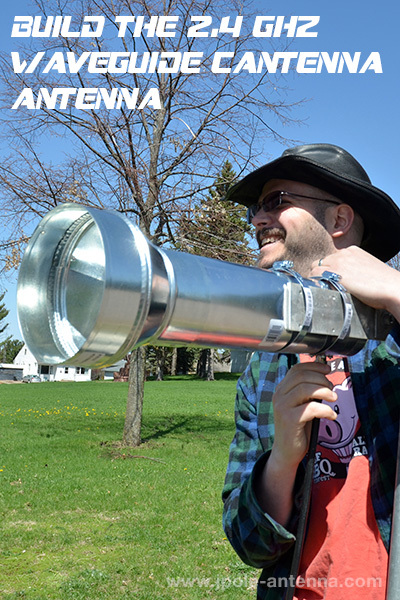 Extend your Wifi router's range and build a node for the Broad-Hamnet Mesh network with this 16dbm waveguide cantenna antenna.